Technology - Ensyn - Renewable Fuels and Chemicals from Non-Food Biomass. Ensyn’s patented RTP® technology is a commercial thermal conversion process that produces high yields of valuable biocrude from renewable cellulosic biomass, typically wood-derived feedstocks. The biocrude is used directly as a renewable fuel oil (RFO) to generate heat, as a refinery feedstock to produce renewable ‘drop-in’ gasoline and diesel, and as a chemical feedstock to produce food flavorings and fragrances. Liquid biocrude yields are typically 70 to 75 wt% from dried wood residues. Byproduct combustible gas and char make up the balance and are used as an energy source to run the plant and dry the biomass feed material. Ensyn's RTP process is the leading technology, worldwide, for the commercial production of liquids from wood biomass using fast thermal conversion. Ensyn has been applying its core RTP technology for more than 25 years for the production of food ingredients, chemicals and heating fuels. It has designed and commissioned 15 RTP facilities for various applications and feedstocks, at different scales, and six RTP facilities are currently in commercial operation. Ensyn is now in the process of increasing production capacity to meet the increasing demand for its liquid fuels. The Ensyn RTP process is based on the rapid thorough contact of hot flowing sand with biomass, which quickly fragments the solid feedstock into vapors, gases and char. The vapors are rapidly quenched, or cooled, and recovered as a free-flowing light biocrude, while the gases and char flow together to a second vessel where the sand is reheated and recirculated back to the conversion unit. Heat is recovered from the gas and char, and used to supply heat for various RTP process applications. The by-product gas is used as a fuel for complementary applications such as biomass drying, or electrical power generation, while the char is typically consumed in its entirety in the reheater to provide the heat required to drive the process. Excess thermal energy, in the form of flue gas, is available for biomass drying or may be directed to a heat recovery unit such as a steam generator. The conversion of biomass to biocrude occurs in less than two seconds. The RTP process does not require expensive complex catalyst systems, hydrogen, or high pressure. These factors, coupled with very short processing time, translate to attractive capital and operating costs. Over twenty-five years of commercial operation and process development has led to processing equipment that is simple, robust and reliable. ﻿The RTP process is similar to Fluid Catalytic Cracking, or FCC, a common and mature process used by the old industry in most refineries to convert petroleum feedstocks to gasoline, diesel and other products. 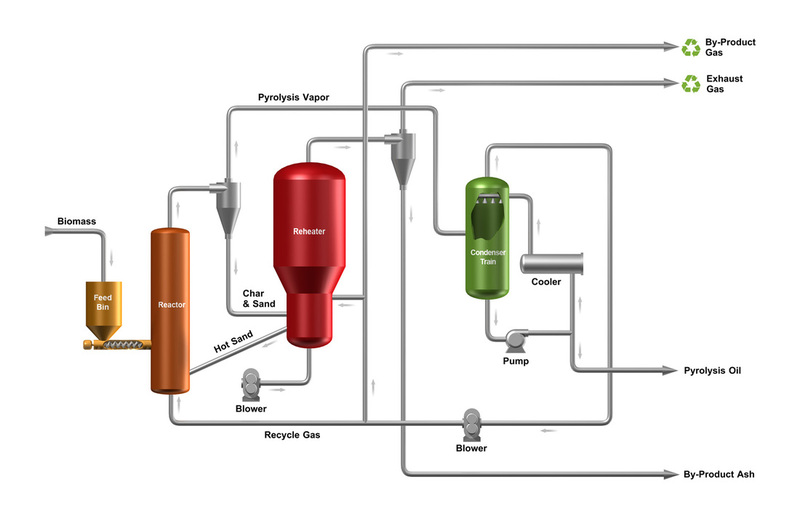 FCC systems circulate catalyst in a closed loop between two key vessels, a conversion unit and a catalyst regenerator, while transforming petroleum into transportation fuels and petrochemicals. Ensyn uses a similar mechanical process, but circulates an inert sand heat carrier, instead of catalyst, to convert wood residues to high yields of a free-flowing liquid biocrude.